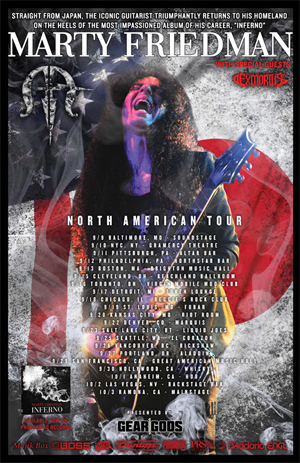 Iconic guitarist MARTY FRIEDMAN is ecstatic to announce his first tour of North America since 2003 -- a 21-date headlining run that will kick off Sept. 9. The trek marks the latest leg of Friedman's ongoing world tour in support of Inferno, his Billboard-charting solo album that so far has seen him complete a record-breaking tour across South America; perform extensively in Europe with acts such as Gus G. (FIREWIND, OZZY OSBOURNE), ARCH ENEMY and KREATOR; and play multiple high-profile gigs in his current home country of Japan, including a set at the country's largest heavy metal festival, Loud Park. "On the rare occasion that I stop and think I about it, I realize I've done an insane thing: I left a successful international band to concentrate my efforts on the domestic music scene of a country thousands of miles from my home. Different culture, different language, different planet. Since I went to Japan, so many Americans have supported me, and while many doubted I would ever play live in my homeland again, now it's happening. Choosing the setlist and doing prep for this tour has been a blast. Words can not describe how excited I am about finally touring North America!" The upcoming North American leg of the Inferno tour will start in Friedman's hometown of Baltimore and wrap up on the West Coast on Oct. 3. Support will be provided by the Los Angeles-based extreme shred outfit EXMORTUS. The complete itinerary can be found below. General admission and VIP packages will go on sale this Friday (10) at 10:00 a.m. local time. For more information, please visit http://martyfriedman.com/. Perhaps the most revered lead guitarist in thrash metal history, Friedman -- whose pioneering work with MEGADETH, CACOPHONY and as a solo artist has influenced legions of players around the globe -- recently returned Stateside to appear at the 2015 NAMM Convention in Anaheim, Calif., where he made a surprise appearance with STEEL PANTHER during the NAMM Jam concert in addition to performing a guitar clinic for students at Hollywood's Musicians Institute and presenting a lecture on Japanese culture at the Japan Foundation of Los Angeles.